Establish your confidential and secure property data in FRASS to be processed through extensive analysis capabilities. The Forest Resource Analysis System Software (FRASS) is offered as a Software-as-a-Service (SaaS) Subscription package. When a client creates their FRASS account, it is locked within the confines of our secure software system. Your data are secure. Subscription Accounts allow multiple Authorized Users to access property records. In the FRASS Account clients collaborate on the information used for Delivered Log Market Portfolios and Real Price Appreciation (RPA) Portfolios. These are applied to parcels to generate timber stand harvest scheduling solutions and asset value. 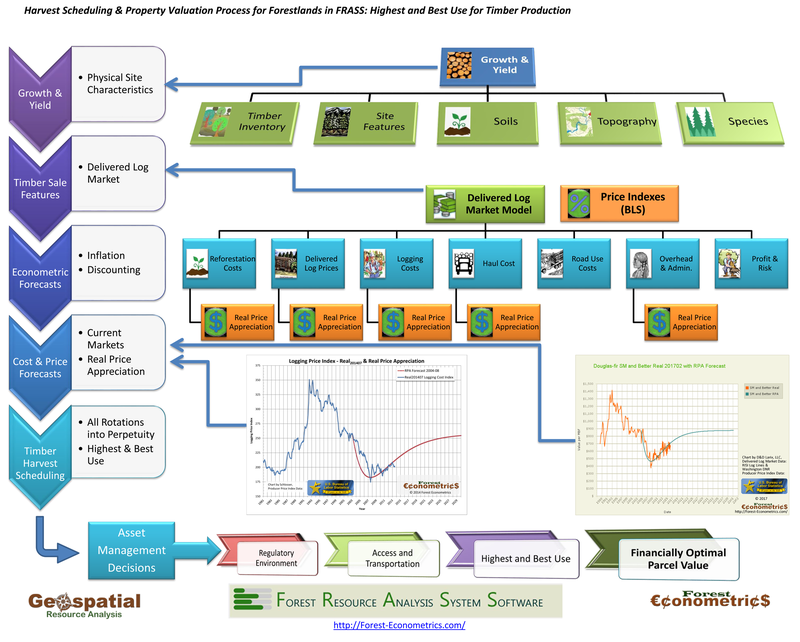 We developed the FRASS system to integrate client property data into advanced econometric analysis protocols. In each FRASS account, data are analyzed with client-specific characteristics, to report time-sensitive actions. These generate financially optimal returns for each situation. This is all enabled on a secure computer-server-system through security enhanced internet connections. The FRASS program processes these data to generate reports most needed by Users in their FRASS account. These analyses are generated in minutes: not weeks or days. They are reduced to screen and printable reports on-demand within each FRASS Account. These four property categories guide and shape how forestlands are acquired, managed, divested, capitalized, and reinforced. All considerations made, in each category listed here, can change how actions on the land are implemented. On this web domain, we explore information used in the FRASS Platform and what that means to owners in their FRASS account. timber stand boundaries across each ownership. A map printed as a picture gives useful information, but the data used to make the map reveals how management can be best implemented. Forestland owners with GIS data prepared, will streamline this portion of their FRASS Subscription. We work with our clients to migrate GIS database information from the GIS application to SQL databases. The FRASS program does not replace or supplement GIS software, we use the results shaped into records to guide decision making and financial consequences. Several forestland owner individuals, families, companies, and agencies do not have a dedicated GIS Department. Some may have GIS staff, but these records may not yet have been developed. We work with our clients to acquire and develop GIS data needed for their FRASS account. Data are assembled to arrange them all into a uniform geographic projection, populate metadata about each layer, and prepare the SQL database information for the client’s FRASS Subscription. All GIS data we create are provided to our client. Our clients not only get the benefit of GIS data we create, but they get those data made operational in their confidential FRASS account. Forest Biometrics expresses each current stand of trees in terms of species, age, environmental responses, growth, and management response. When processed through forest Growth & Yield projections these data results give form to the logs grown within each timber stand at future dates. It all begins with forest inventory data. certain site characteristics are documented. These data give expression to the growth potential of the site and of the tree species currently on the property. Forest Biometric computer programs operated by biometricians, can process these inventory data into meaningful Growth & Yield projections. Tree growth is neither constant through time, nor are trees continuously growing. Most federal lands have timber harvest considerations removed from active deliberations. Forest value recovery has been mostly bypassed as creation of wildlife habitat, fisheries aquatic territory enhancement, and aesthetic issues have moved to define the Highest and Best Use on these lands. These federally managed lands still have value, albeit the value is measured not by economics, but instead through social value. Non-governmental forestland management is not guided by these same conditions. Many of the ‘other uses’ of forestlands also serve as considerations for these forestland owners. However, the realities of managing the financial asset of every property is a guiding force. This is where the FRASS Platform brings unifying clarity. Forest Biometric assessments are combined with physical site conditions expressed in GIS data to shuffle into forest econometric value projections. Organizations use these data in the operational management of their forestlands. These are how asset values are established and expressed as a part of normal business operations. If your organization maintains these data, they can be migrated into your confidential and secure FRASS account. The FRASS Platform neither REPLACES the GIS applications nor the Forest Biometrics programs used. Data from these tools are converted to secure databases expressing current conditions and expected future conditions. The FRASS Platform manages these SQL database fields into meaningful value calculations. These are used by people in the organization to make strong and informed trade-off decisions to boost asset value. We assist organizations to integrate these data into their tool-belts. GIS data are needed to initiate and advance your managerial insights. Working with you, we collect forest inventory data, expressed through Forest Biometrics analysis protocols, and conveyed into your active FRASS Account. As we collect and process these data, we transfer them all to our client who requested them. The GIS shapefiles, populated with metadata and placed into a consistent geographic projection, are given to the client for use without restriction. Forest inventory data and all forest biometrics files we create and process are transferred to our clients for future uses. These are data advancing the property’s ultimate return on investment. Although forestland properties are each unique, they all exist in shared marketplaces. These marketplaces witness sell and purchase transactions of timber products. In most timber markets, these are guided by state rules of measuring logs by sort and grade. Payments are negotiated between each buyer and seller as they reach equilibrium price. It is this price that directs ultimate profitability associated with each timber sale. Do you KNOW what your logs will sale for in the market tomorrow? How about in one month, in one year, or 5 years from now?This is the question that plagues forestland investors, even the large companies with staff who examine these data continuously. Individuals often have a ‘feel’ for climbing or dropping market conditions. However, actionable data is often scarce for the companies who enter log price negotiations irregularly. Timber market cycles evident in North America and eastern Asia have been articulated through market cycle responses by D&D Larix, LLC. These data are filtered through macroeconomic conditions to show market cycles for each timber sort and grade exchanged in regional marketplaces. Equilibrium price predictions of strategic and tactile time frames are established in each value projection made for our clients. Equilibrium prices into the future are combined with biometric volume estimates to generate future values possible through timber harvest events. We do not assume prices next year will be the same as they were today. We estimate market cycles and synchronize them to the forest biometrics of each timber stand on each property. Tens-of-thousands of future value projections are made for each timber stand rotation, on each property, for each client making projections. The Real Price Appreciation (RPA) Forecast Tool, complete with delivered log market actualization and forecast horizons was developed by Dr. William Schlosser, and is at the core of price projections made in FRASS. Those tools are made alive in FRASS Subscriptions. This gives meaning to ‘when’ timber harvest is most profitable in current value terms. All forestlands are unique, with exclusive soils combined with an environment supporting the trees on those lands. Forestland owners of these properties are equally inimitable as each person or group carries different objectives and goals. Owners come in the form of an organization with many shareholders, or as a family forest considering intergenerational transfers. These are placed on an equal footing with current management terms. We seek to articulate all forestland owners expressed in economic and management goals. Oftentimes, landowners seek the Highest and Best Use in financial return measurements to their properties. This is guided by Return on Investment measurements. Since timber was first harvested to make lumber at mills, this has been measured by net payments received for logs delivered by forestland owners to lumber mills. Today this can be augmented by landowners selling Carbon sequestration rights in their timber (also measured using Forest Biometric strategies). It may include selling hunting rights, or by managing riparian zone filtered water resources to the local municipalities. Income valuation takes many forms, but all are individually respected. When financial returns come as a payment to the landowner, a financial exchange is executed and Return on Investment criteria are reached. Overall financial stabilization is promoted. We do not assume that the time value of money is the same for all forestland owners. Each landowner can initiate ‘what if’ scenario to determine the sensitivity of factors such as the rate of inflation in the macroeconomy, their individual or organizational discount rate, and levels of acceptance for time-influenced risks. Projections of value through time and discounting to current day terms are empowered in each FRASS account – Income Capitalization. These issues are discussed throughout this web domain to explain the FRASS account appreciation for the time value of money. This is the realization of financial returns which makes each landowner’s decision criteria unique. Here you put them into action. A subscription to a FRASS Account. As described above, if our clients do not have the GIS data and/or the biometrics data, we can assist to make them. These are recorded and entered into a secure FRASS account, accessible only to authorized users. Generally, our clients select the option to host their secure Platform on our maintained server domain where all data are routinely updated from off-site data repositories. This is the SaaS structure most attractive to our clients. Those who wish to host the Platform on their own server domains are welcome to purchase the software. It is installed locally, and operated within an established and secure domain. These possibilities are available to users as financially optimal timber harvest rotation timing is sought. We have hosted clients with their forestland property data already described. Those properties take generally about 3 months to activate in a fully operational and secure FRASS Account Platform. Some clients have requested a FRASS Platform with no GIS or Biometric data previously established. By working with these clients, we have established all requisite data and expressed them into a secure and active FRASS Profile. Some of these data creation events can be made active within about one year. Of course, the size of the ownership, its arrangement as consolidated or dispersed, affects how long it takes. We will work with you to make it operational, sustainable, and valuable to your forestland management objectives. This is what we do.